This remarkable edition of The Art of 3D Computer Animation and Effects offers clear, step-by-step guidelines for the entire process of creating a fully rendered 3D computer animation. With up-to-date coverage of the latest computer animation styles and techniques, this versatile guide provides insightful information for creating animations and visual effectsfrom creative development and preproduction to finished animation. Designed to work with any computer platform, this Fourth Edition cuts through technical jargon and presents numerous easy-to-understand instructive diagrams. Full-color examples are presentedincluding VFX and animated feature movies, games, and TV commercialsby such leading companies as Blue Sky, Blur, BUF, Disney, DreamWorks, Electronic Arts, Framestore, ILM, Imagi, Microsoft, Mac Guff, The Mill, Menfond, Pixar, Polygon, Rhythm & Hues, Sony Imageworks, Tippett, Ubisoft, and Weta, and many other studios and groundbreaking independent artists from around the world. 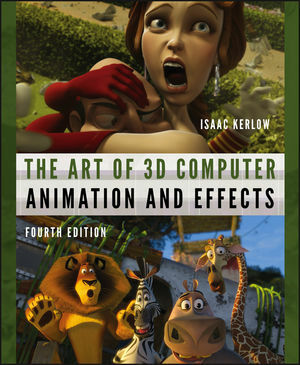 This fully revised edition features new material on the latest visual effects techniques, a useful update of the traditional principles of animation, practical information on creative development, multiple production pipeline ideas for shorts and visual effects, plus updated information on current production trends and techniques in animation, rendering, modeling, rigging, and compositing. Whether you are a student, an independent artist or creator, or a production company team member, The Art of 3D Computer Animation and Effects, Fourth Edition gives you a broad palette of tips and techniques for bringing your visions to life through 3D computer animation. ISAAC KERLOW is a director and animation expert with years of development and production experience, including over a decade at The Walt Disney Company in Los Angeles, California. He creates films and art projects working with interdisciplinary teams at the Earth Observatory of Singapore, and is a longtime active member of SIGGRAPH and the Visual Effects Society. Chapter 1: Animation, Visual Effects, and Technology in Context. The Development of the Technology. Chapter 2: Creative Development and the Digital Process. The Digital Computer Animation Studio. The Production Process of Computer Animation. Chapter 5: Advanced Modeling and Rigging Techniques. Logical Operators and Trimmed Surfaces. Procedural Descriptions and Physical Simulations. Amination Rigging and Hierarchical Structures. Steps in the Rendering Process. File Formats for Rendered Images. Basic Components of a Light Source. Basic Positions of Light Sources. Chapter 9: Shading and Surface Characteristics. Surface Shaders and Multi-Pass Rendering. SECTION IV: ANIMATION AND EFFECTS. Chapter 10: Principles of Animation. Chapter 11: Computer Animation Techniques. Keyframe Interpolation and Parameter Curves. Forward Kinetics and Model Animation. Chapter 12: Advanced Computer Animation Techniques. Performance Animation and Motion Capture. Motion Dynamics and Fluid Simulations. Chapter 13: Visual Effects Techniques. Blue and Green Screens and Chroma Keys. Motion Capture and Visual Characters. Chapter 14: Retouching, Compositing, and Color Grading. Basic Concepts of Image Manipulation. Chapter 15: Image Resolution and Output. Basic Concepts of Digital Output. Image File Formats and Aspect Ratios.